The theory of quantum mechanics is well supported by experiments. Now, however, a thought experiment by ETH physicists yields unexpected contradictions. These findings raise some fundamental questions—and they're polarising experts. 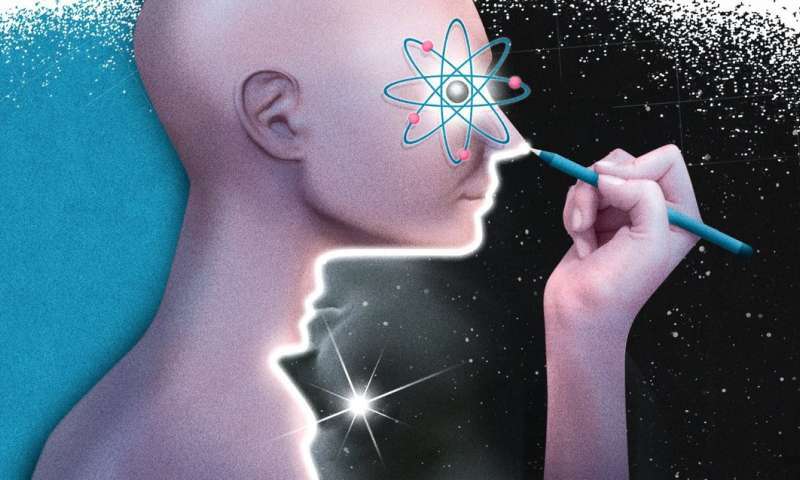 There is likely no other scientific theory that is as well supported as quantum mechanics. For nearly 100 years now, it has repeatedly been confirmed with highly precise experiments, yet physicists still aren't entirely happy. Although quantum mechanics describes events at the microscopic level very accurately, it comes up against its limits with larger objects—especially objects for which the force of gravity plays a role. Quantum mechanics can't describe the behaviour of planets, for instance, which remains the domain of the Theory of General Relativity. This theory, in turn, can't correctly describe small-scale processes. Many physicists therefore dream of combining quantum mechanics with relativity to form a coherent worldview. Though both theories describe the physical processes in their domains very accurately, they differ greatly. How can they be combined? One possibility is to conduct quantum physics experiments with increasingly larger objects in the hope that discrepancies will eventually appear that point to possible solutions. But physicists must work within tight constraints. The famous double-slit experiment, for instance, which can be used to show that solid particles simultaneously behave like waves, can't be performed with everyday objects. Thought experiments, on the other hand, can be used to transcend the boundaries of the macroscopic world. Renato Renner, professor of theoretical physics, and his former doctoral student Daniela Frauchiger have conducted such a thought experiment in a publication in Nature Communications. Roughly speaking, in their thought experiment, the two consider a hypothetical physicist examining a quantum mechanical object and then use quantum mechanics to calculate what that physicist will observe. According to our current worldview, this indirect observation should yield the same result as direct observation, yet the pair's calculations show that this is not the case. The prediction as to what the physicist will observe is exactly the opposite of what would be measured directly, creating a paradoxical situation. Although the thought experiment is only now being officially published in a scientific journal, it has already become a topic of discussion among experts. As the publication process was repeatedly delayed, other publications are already addressing the findings—itself a paradoxical situation, Renner notes. The most common initial reaction of his colleagues in the field is to question the calculations, Renner says, but so far, no one has managed to disprove them. One reviewer conceded that he had meanwhile made five attempts to find an error in the calculations—without success. Other colleagues presented concrete explanations as to how the paradox can be resolved. Upon closer inspection, though, they always turned out to be ad hoc solutions that don't actually fix the problem. Renner finds it remarkable that the issue evidently polarises people. He was surprised to note that some of his colleagues reacted very emotionally to his findings—probably due to the fact that the two obvious conclusions from Renner's and Frauchiger's findings are equally perplexing. The one explanation is that quantum mechanics is apparently not, as was previously thought, universally applicable and thus can't be applied to large objects. But how is it possible for a theory to be inconsistent when it has repeatedly been so clearly confirmed by experiments? The other explanation is that physics, like politics, suffers from a lack of clear facts, and that there are other possibilities besides what we deem to be true. Renner has difficulties with both of these interpretations. He rather believes that the paradox will be resolved in some other way: "When we look back at history, at moments like this, the solution often came from an unexpected direction," he explains. The Theory of General Relativity, for instance, which solved contradictions in Newtonian physics, is based on the realisation that the concept of time as it was commonly understood back then was wrong. "Our job now is to examine whether our thought experiment assumes things that shouldn't be assumed in that form," Renner says. "And who knows, perhaps we will even have to revise our concept of space and time once again." For Renner, that would definitely be an appealing option: "It's only when we fundamentally rethink existing theories that we gain deeper insights into how nature really works." Here, we propose a Gedankenexperiment to investigate the question whether quantum theory can, in principle, have universal validity. The idea is that, if the answer was yes, it must be possible to employ quantum theory to model complex systems that include agents who are themselves using quantum theory. Analysing the experiment under this presumption, we find that one agent, upon observing a particular measurement outcome, must conclude that another agent has predicted the opposite outcome with certainty. The agents' conclusions, although all derived within quantum theory, are thus inconsistent. This indicates that quantum theory cannot be extrapolated to complex systems, at least not in a straightforward manner. "When we look back at history, at moments like this, the solution often came from an unexpected direction," he explains. The Theory of General Relativity, for instance, which solved contradictions in Newtonian physics, is based on the realisation that the concept of time as it was commonly understood back then was wrong. Revising their concept of Space and Time (once again) is a good start. Space is a foundation of support for Matter/Energy in both the Macro and Quantum levels. And Time is only used as a Measurement of duration of events and the Timing of the distance of an event. Renner and Frauchiger are on the right track for a good reconciliation of Quantum and Macro, IMO. But they will be beset with quite a lot of hostility from colleagues who may have not much desire to find that a tradeoff is necessary when they are used to what they have learned out of textbooks and lectures/seminars. It will take a lot of experimenting in order to convince others and the Nobel Committee as to the merits of their future discoveries. I will keep track of their developments. "Finally, (S) is the requirement that, from the viewpoint of an agent who carries out a particular measurement, this measurement has one single outcome. " I briefly read over the reference in Nature Communications and don't pretend to fully understand it. So with a grain of salt, I do ask that quantum mechanics already stands on a contradiction of normative logic resolved to my understanding in one of three ways: multi-universe (histories), forwards and backward time travel, and simulation theory. Basically, the first might involve an unfolding that is not recognized in the statement of this paradox. The second would involve a liar's paradox loop in logic turned into a loop in time. The third is the broadest--and you should pardon this "philosophical reference" but per Bugs Bunny in I believe a 1950's animation doing some actually less radically impossible, he comments to the viewers, "Anything can happen in a cartoon." Frauchiger and Renner assume that a measurement does not change anything, at least from some other observer's viewpoint, but that is incorrect. Hence, their conclusion that QM is inconsistent is wrong. For a detailed analysis, please see the relevant 'Reference Frame' Blog by Lubos Motl dated 20 September, 2018. Okay, Thought Experiment with supporting math. How is this any different than Computer Simulations? To date, the Theory of Quantum Mechanics has been verified by numerous physical experiments. What will be the physical experiments needed to attempt to confirm the hypothesis in this article?